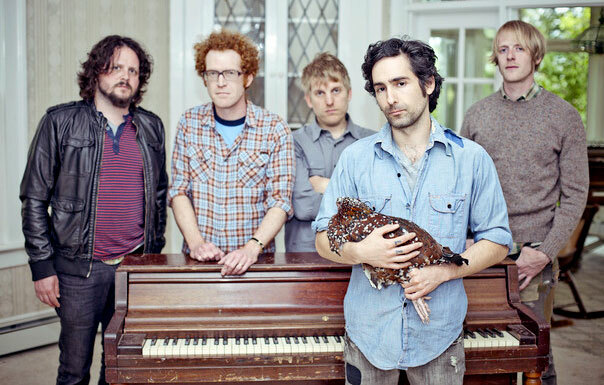 We headed to the Revival Stage last night to catch the later half of Blitzen Trapper’s set. We watched with dropped jaws as the band rocked through songs from their latest album, American Goldwing. We were pleasantly surprised to find the band’s live renditions of these songs to be much heavier and electric guitar based than they appear on the album. Despite their energy, I’m not sure if Wakarusa was the right setting for Blitzen as the crowd was rather sparse towards the end of their set. The band might have realized this too, as the guys abruptly ended their set five minutes early. After grabbing a couple Pale Ales, we made our way to the main stage to find the biggest crowd we’ve seen yet at Wakarusa. The crowd watched in awe as Edward Shape and the Magnetic Zeros finished out the end of their hour and a half set. Among the songs we got to hear were “Janglin,” “40 Day Dream,” and the athemic “Home.” The crowd went nuts when the band started in on a remixed version of “Home.” You could tell by the fans’ enthusiasm at the end of their set, Edward Sharpe had put on a damn good show.